We are nearing the end of the process of re-mastering every Laserburn vehicle in 15mm scale into either high grade resin or new white metal molding. It has been a lot of work as you can imagine but its also been a lot of fun too. 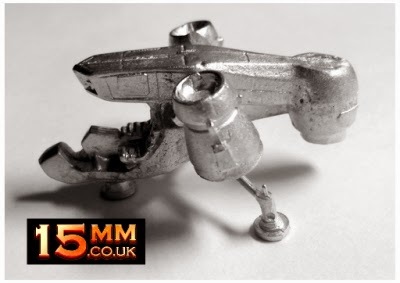 Thanks to everyone who has already gotten themselves the smaller vehicles such as the Flit Car, the Hover Van or the awesome Law Officer Air Raft from the Laserburn page at 15mm.co.uk. Above you can see a picture of the newly re-mastered into grey tone resin V008T Glaive APC with an Imperial Trooper for scale. We have kept the details of each vehicle as faithful as possible to the beloved originals with only small changes here and there to accommodate the new production medium. However with the tracked variant of the Glaive it was necessary to build new tracks from scratch due to deterioration of the original masters. While almost all of this list will be released in resin some do have white metal components and these have all be re-master and molded up freshly. I know there are many hundreds of Laserburn fans who are keen to get their hands on these new versions of classic 80's sci-fi and I can say that the pricing on the new versions will be lower and in some cases much lower than the original all metal versions. There are a number of factors involved in this but mainly its down to the weight of the original metals. Codes such as V011 Scorpion Air Lander were very heavy indeed and required special conditions to cast as solid objects. So what is first up...its the V105 Sabre Jet Copter and its looking awesome! Keep an eye on the blog once the Space Raptor madness is done with! Thanks. Its been a long road but they must live once more! These look absolutely fantastic. Well done. I can envision these prowling the streets of the Big Meg as well as the battlefields of the Ion Age. Thanks. They are renewed vintage fun. The Scorpion is a beast of a model when in white metal but now its in resin its totally fine. We nicknamed it the 'skull cracker' when it was metal and it was the heaviest single piece we made. But more on it when its finished. The Sabre is a great little model and it sits well on the Ion Age landing pad. I'll probably get some more V008A Glaive Class APC (Anti-Grav) to go with my metal ones, my metal Imperial scout car didn't come with any motive part but then I got it many many many moons ago from TTG, I should still have a metal Scorpion lander as well if I can find the boxes I put them in when I moved. I used them in Imperial Commander and G-Cav. Thanks for your comment Paul. 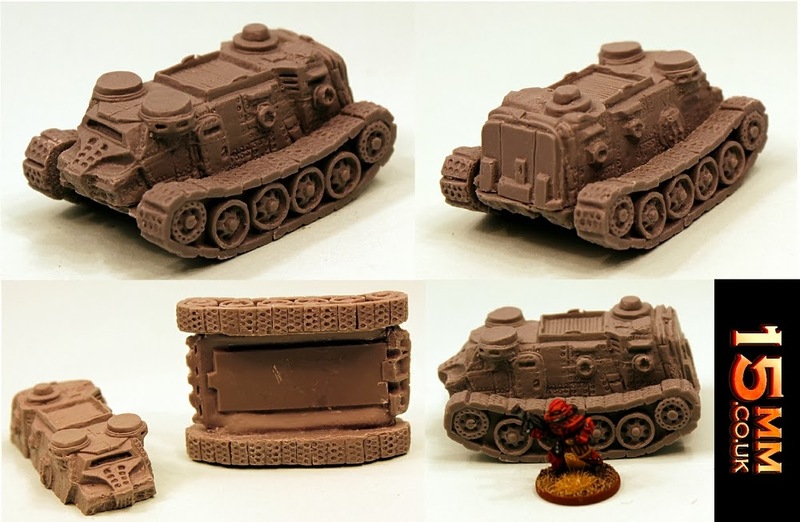 We have made some tweaks to the original listing of models in that the Imperial Scout Car which originally came in three metal parts had a upper hull, a cabin top and a tracked propulsion piece. Now it will come with the same but also the option of hover or anti-grav or wheeled propulsion choices. If you find your Scorpion I would like to see it.